The Latvian sawmill Vika Wood operated with EUR 59.651 million in turnover in 2016, which was 0.8% more than the previous year, while the company’s profit reached EUR 2.969 million in contrast to a loss a year ago, according to Firmas.lv business database, cites LETA. 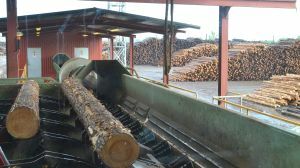 The company’s management said in its report that the recent warm winters left a negative impact on demand for the company’s byproduct – shingles, while the pulp market was stagnating. At the same time, Vika Wood increased production by 1.7%. Last year Vika Wood sold most of its products in Japan (28.3%), Latvia (22.9%), Estonia (12.2%), Germany (6.9%), the UK (4.5%), Lithuania (4.3%), Egypt (3.9%), the Netherlands (3.7%). In total the company’s products were exported to 32 countries. The company also invested EUR 640,941 in development last year. Vika Wood is one of Latvia’s leading, and largest, sawmills with a total annual production of about 280,000 m3 of sawn timber. Vika Wood is located in Latvia's Kurzeme Province near Talsi (western Latvia). The company was established in 1995 and has a share capital of EUR 8,618,397. According to Firmas.lv, the company's shares are owned by Iceland's Norvik Hf.